The first recently introduced Volvo L260H loading shovel to be sold in Great Britain has been delivered to Lightwater Quarries Ltd, North Stainley, near Ripon. 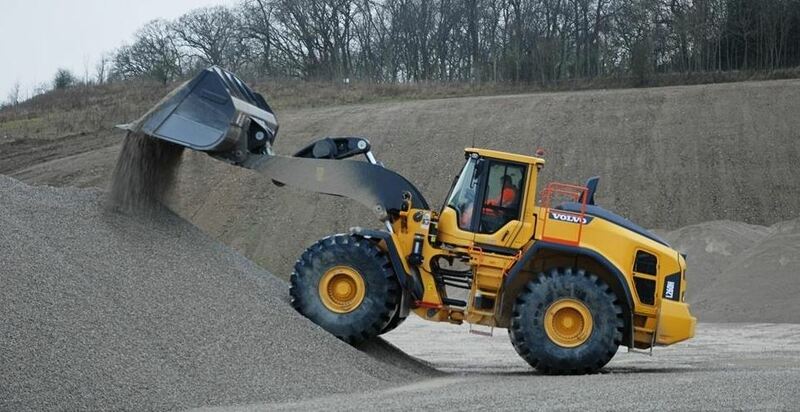 As the Ripon-based aggregates business increases its production to around 600,000 tonnes per annum, Lightwater Quarries Ltd identified the need to go larger with its prime mover. Replacing an L180G the new L260H weighing in at 35 tonnes complete with a 5.7m³ straight-edged bucket and teeth was identified to fit the bill according to General Manager, Kevin Parker. “We needed a loading shovel that could load our recently acquired 40-tonne rigid truck in four clean passes besides stockpiling, keeping the belts clear of material and on occasions, extract material from the face,” explains Kevin. “Having owned and operated Volvo products for many years we were quite confident in the L260’s credentials and so far, we are very pleased with the machine’s productivity and fuel efficiency,” he continues. The L260H replaces the L250H and is primed for productivity. It is equipped with a powerful Stage-4 final engine, delivering 6% more power and 5% more torque than its predecessor. The next generation of load-sensing hydraulics has been designed to enhance the responsiveness of attachments and improve the lifting and lowering speed of the boom. For faster cycle times, the new HTL310 transmission works in harmony with the powerful engine and axles, and the new converter delivers increased torque output, resulting in better performance. Moreover, steps between gears have been reduced, for faster acceleration. Fuel efficiency has been increased by up to 10%, thanks to a host of improved features. The next generation hydraulics save hydraulic pump power for other functions, by reducing fluid flow when lowering and dumping. The new, dry P-Brake eliminates drag losses, caused by the internal wet multi-disk brake. In addition, the upgraded OptiShift technology integrates the reverse-by-braking (RBB) function – patented by Volvo – and new torque converter with lock-up, creating a direct drive between the engine and transmission, reducing fuel consumption significantly. Also contributing to fuel efficiency is Fully Automatic Power Shift (FAPS), which shifts the gears to match the engine and travel speed to the best gear ratio. The L260H is also equipped with an Eco-pedal – a feature unique to Volvo – which encourages economical operation by applying a mechanical push-back force in response to excess use of the accelerator. With its 5.7m³ bucket the new L260H is easily shifting in excess of 2,000 tonnes of crushed limestone material in a daily shift with an average density of 1.8 tonnes / m³. The new loading shovel joins existing Volvo equipment owned and operated by Lightwater Quarries Ltd including two smaller L180H shovels and a 30-tonne EC300EL. One of each is being operated at the company’s other quarrying facility located near Masham. Lightwater Quarries is a leading supplier of aggregates and concrete to both small and large customers in York, Ripon, Harrogate and across North Yorkshire. As a family owned business, its philosophy is based on putting the customer at the heart of everything it does, whilst ensuring a sustainable future.